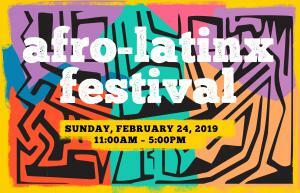 – Come celebrate the cultural diversity of the Americas and the African influence in Latin America at MOLAA’s Afro-Latinx Festival. This one-day festival highlights the African legacy in Latin America and offers visitors the opportunity to experience a mixture of customs from African and Mestizo peoples in the Americas. Whether you prefer munching on Peruvian anticuchos or exerting a little more energy dancing to salsa music, MOLAA has a full program of indoor and outdoor events and live performances for you and your family to watch or participate in and enjoy. Bring your kids for story time with the Long Beach Public Library in our Screening Room, or to get their faces painted (for free! )in the Viva Event Center and browse the craft vendor stalls while grooving along to supercool DJ Eusébio Akasa. After a delicious lunch from one of our food vendors join your friends in the Sculpture Garden for one of the scheduled live performances. The Lidereibugu Garifuna Ensemble is a traditional and contemporary cultural vocal, dance and drumming group based in Los Angeles and evolved under the leadership of Erica Zuniga. As Garifuna women and men connected to the lands of Belize, Guatemala, Honduras, Nicaragua and St Vincent, the Ensemble’s objective is to continue to preserve the rich Garifuna culture through song, dance and drums. ABADÁ -Capoeira promotes Capoeira and Brazilian culture as example for social integration and individual growth. Capoeira – pronounced cap-wearer – is a Brazilian martial art form that combines self-defence, acrobatics, dance, music and song. Developed by slaves who used it to disguise the fact that they were practising fight moves, Capoeira is 'played' – it's known as the 'game', or jogo – in a circle called a roda, accompanied by music and singing. Only the hands and feet touch the floor. The name QUITAPENAS gives you a taste of this group’s rhythmic contagion. It means, “to remove worries.” This tropical Afro-Latin combo borrows aesthetics from the radical 60s, 70s and 80s. Each song echoes a remix of history and invites you to engage in the liberating evenings of Angola, Peru, Colombia, Brazil and beyond. Quitapenas’ mission is simple: to make you dance and send you home without a worry. In the gallery, visit La Huella Múltiple/ The Multiple Print, a collaborative project developed in 1996 by artists Sandra Ramos, Belkis Ayón, Abel Barroso, and Ibrahim Miranda with the collaboration of Ludwig Foundation, el Consejo Nacional de las Artes Plásticas (CNAP), the Unión de Escritores y Artistas de Cuba (UNEAC), and the Centro de Desarrollo de las Artes Visuales of Havana, Cuba among many others. La Huella Múltiple seeks to gather the best graphic works produced by established and emerging Cuban artists. Through this collaborative interdisciplinary project, artists aim to expand the concept of printing, incorporating media that include photography, performance, installations, and new technologies. The Afro-Latinx Festival program is scheduled with the generous support of the Port of Long Beach.